Fish gelatin-chitosan-MMT multicomposite films as edible packaging film. Optimized ratio of dry ice for preservation of fresh fish. Sous vide cook chilled technology to extend shelf life of fish cutlets. Hot filled technology to extend shelf life of fish curry. 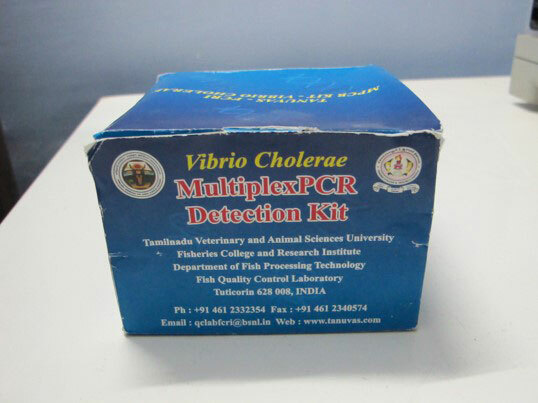 Multiplex PCR assay for the detection of the Salmonella, Vibrio cholerae and E. coli. Multiplex PCR assay for the detection of the different species of Aeromonas. Multiplex PCR assay for the detection of the Aeromonas hydrophila, Staphylococcus aureus and Listeria monocytogenes. A rapid fluorescence based formalin detection kit . Collagen peptides from fish bone by enzymatic analysis. PCR-RFLP markers for authentication of shrimps products. A rapid protocol for pesticide analysis in seaweeds by GC-MS.
A microbial assay for chloramphenicol detection of farmed shrimps. Molecular markers for the authentication of pasteurized blue swimming crab. Multiplex PCR assay for the detection of the different sub species of Salmonella. Multiplex PCR assay for the detection of the different serotypes of Vibrio cholerae. Multiplex PCR assay for the detection of the different strains of Escherichia coli.